Raspberry Rooster - or, Pheasant and the Phield | an UplandLife.com recipe. We adapted this fine summer pheasant dish, which we call Raspberry Rooster, from the entry titled "Spinach Salad with Grilled Chicken, Mango, and Raspberries" as found on Epicurious.com. Beyond the obvious (replacing the chicken with pheasant), we substituted a fresh raspberry sauce for the raspberry vinegar (see the section at the bottom of this page for some substitution suggestions), which made the dressing and marinade a bit more substantial. We also made enough of that sauce to dress up dessert. To make the dish a little more savory, we sautéed the mango slices in butter and fresh ginger root. 1/2 cup of your raspberry sauce (see below). Be sure to have extra for dessert! Whisk together the ingredients above and use half of it for the marinade, and the other half for the salad dressing you'll use as you serve. This can be made, and kept refrigerated, a day or two ahead of time. 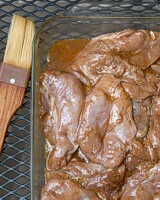 Coat the pheasant pieces with the marinade and refrigerate, in a glass container, for 3-6 hours. Marinades contain acid in the form of vinegar, wine, and/or citrus, which tenderize the meat. If you have older roosters (second year), marinating overnight will work fine, but for younger or pen-raised birds that length of time may tenderize too much giving the meat an unwanted soft texture. To add another layer of savory flavor, we lightly pan fried the mango slices in a teaspoon of butter with a 1/4-teaspoon of finely grated fresh ginger. Simply brown on one side, flip once and brown the other side. Toast the walnuts on a baking sheet in a 325F oven for 5 to 10 minutes, keeping an eye on them so they don't burn. Once they're cool, coarsely chop them into 1/2-inch size pieces. Grill the marinated pheasant meat until it's just cooked. Grilling time can	take as little as just 4 minutes per side. A good hot grill will stripe the meat and carmelize the marinade for a more complex taste and texture. As you work, check the inside of a medium-size piece early to be sure you don't overcook! Toss the spinach, scallions, and toasted walnuts with enough dressing to coat. Place a serving on each plate and arrange the remaining ingredients for presentation. Drizzle the salad with a touch more dressing and put the rest, in a serving container, on the table. We also served a simple light potato salad on the side. Boil potatoes gently until just tender (medium-high heat and just rolling to keep the potatoes intact). Drain, rinse with cold water and cool down in the refrigerator. It's a nice salad to serve just slightly cool or at room temperature. Cook the bacon in pan until well done and crispy and chop into 1/4 pieces. Set aside on a paper towel. Drain the bacon grease from the pan, leaving bits for flavor, and add a teaspoon of butter. Reheat the pan and cook (over medium to medium-high heat) the onion slices until brown. Set aside on paper towel to soak off excess grease. Whisk Dijon mustard and vinegar until smooth and continuing to whisk slowly drizzle in the olive oil. Season to taste with salt, pepper and a dash of cinnamon. Mix gently with potatoes and chopped parsley, bacon and sautéed onion. If you take the time to make the raspberry sauce you won't regret it. But if you're short on time you can sometimes find it at a gourmet grocer or substitute a quality seedless raspberry preserve - but you'll need to add a tablespoon of lemon juice to offset that product's added sweetness. If you're feeling adventuresome, try using a fine raspberry sorbet instead, though we have not yet tried that! Let us know how it turns out. For folks who are not kitchen savvy, here are some planning suggestions that will help to schedule the tasks that make up this meal's presentation. Remove the frozen pheasant from the freezer and thaw in the refrigerator overnight. 1) Bone the birds using our helpful photo tutorial for guidance. If you're an ol' pro with a boning knife, have at it whenever you're ready. 2) Shop your favorite grocery sources for the best and freshest ingredients. 4) Make the raspberry sauce. For an easy dessert, make sure you have purchased enough raspberries (and perhaps blackberries, too) to top a quality vanilla ice cream drizzled with some of the raspberry sauce. 5) Prepare the marinade and store equal halves in separate containers - one to be used as a marinade and one to be used as a salad dressing. 6) To get a jump on the potato salad prep you can chop the parsley, cook the bacon, brown the onion, and whisk together the dressing. Store those four items in the refrigerator and you'll have them ready when, closer to dinnertime, it's time to assemble that dish. Chill the wine. We served this dish with a delightful Gewürztraminer made in the drier, spicier Alsacian style by Washington state's Chateau Ste. Michelle. 2) Boil the quartered potatos - see recipe. 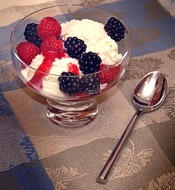 For dessert, simply serve vanilla ice cream topped with the raspberry sauce and sprinkle with rinsed fresh berries. Always start with the best, freshest produce and other market items you can find. You took this pheasant with a nice shotgun, a fine dog, and quality shells, right? Do it justice.